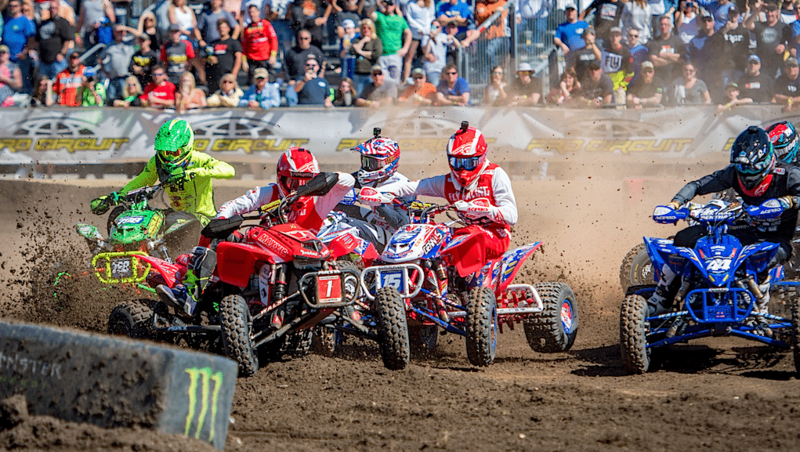 Everyone looks forward to the week in Daytona, Florida when the new ATV motocross season begins. 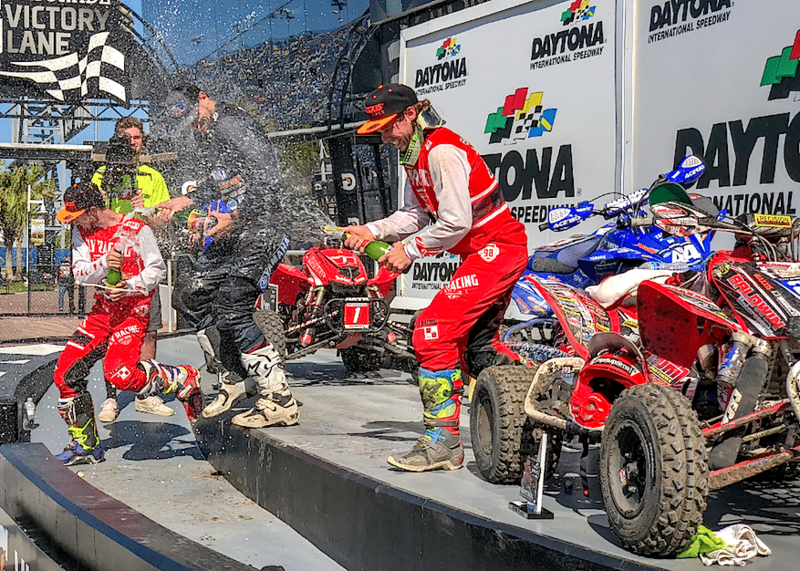 This month of March was the 4th Annual Daytona ATV Supercross and it proved to be an exciting showdown between the country’s fastest quad riders. Perhaps the fastest in the world. 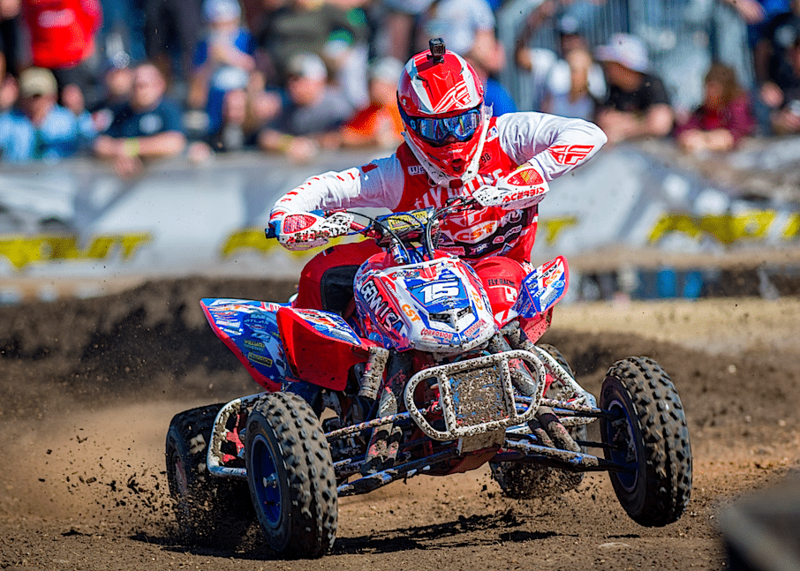 Chad Wienen has won the National ATV Motocross Championship 5 times in his racing career, but he lost the title in 2017 to Joel Hetrick. When the starting gate dropped at Daytona it looked like Chad was very determined to put his Yamaha YFZ450R back on top. Of course, Joel and his Honda TRX450R seemed just as eager to defend the title. The battle between these two top guns carried them ahead of the pack, and the large crowd of spectators really enjoyed watching this Honda versus Yamaha show. Daytona is rather unique for the riders, because the supercross style track is temporarily built on the infield of the speedway. This means everyone is riding it for the first time and on equal terms. After Daytona the series moves to existing motocross tracks, which provides an advantage to veteran riders and those who live near and practice on those particular tracks. 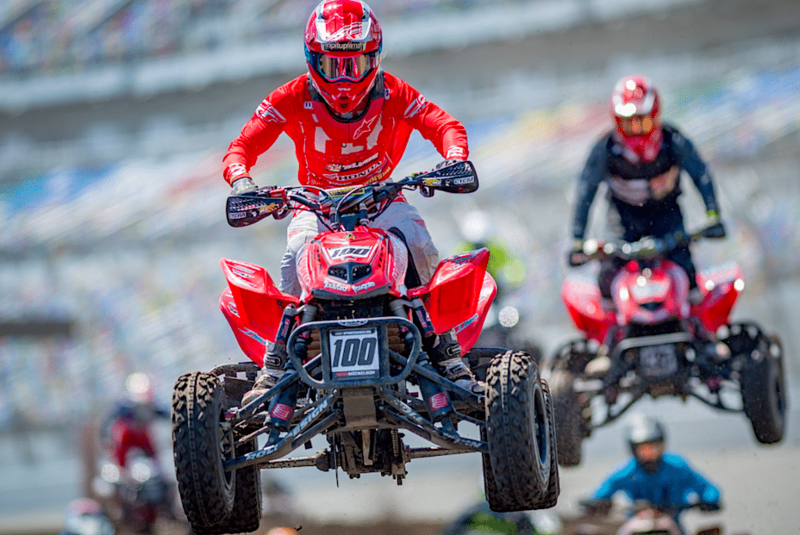 After the intense action on Daytona’s Supercross track it was Chad Wienen (44) who took the checkered flag first with Joel Hetrick (1) in second. Behind them was a large pack of fast riders fighting for third spot on the podium. That turned out to be Jeffery Rastrelli and his Honda, followed by Thomas Brown and his Yamaha, and Nick Gennusa (15) on his Honda. The Dirt Wheels crew gives a thumbs up to all of the riders who made the trek to Daytona. 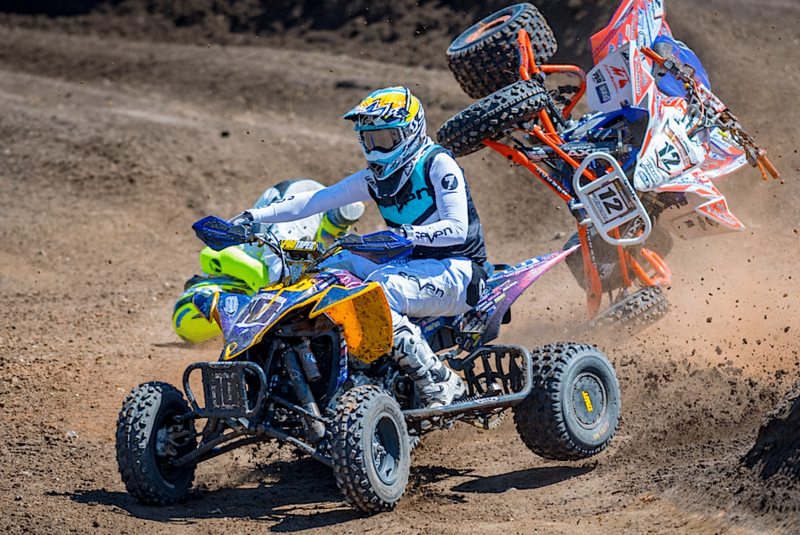 We know it’s not easy to run the National ATV Motocross circuit. It involves major effort setting up a machine, hours and hours of riding practice and traveling all over the eastern United States. After all that, you test yourself against the very best. We all wish we could, but you actually do it. Thanks. 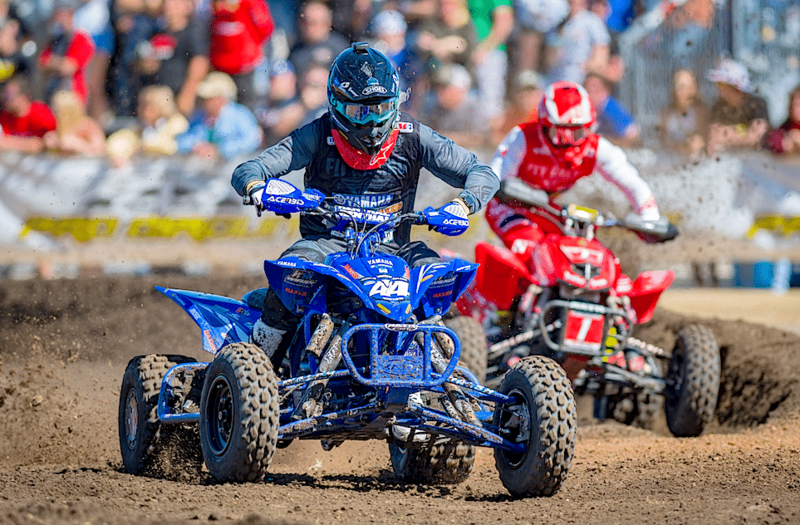 Along with the pro class, the ATV Motocross Nationals include amateur classes too. They wear the same protective riding gear as the pro riders, because they sometime take a tumble too. Usually, they get back up, remount and continue on. For more information on the 2018 ATV Motocross National Championship, visit the series official website at www.atvmotocross.com or call (304) 284-0101.